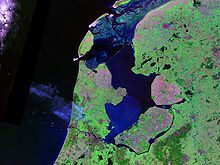 The Zuiderzee in the Netherlands is a Polder. Old land is mostly green, new one is darker in color. Empoldering is a method of reclaiming land from the sea. Empoldering involves the use of polders, and is also a way to control floods. A polder is a piece of land in a low-lying area that has been reclaimed from a body of water by building dikes and drainage canals. Although empoldering is usually carried out in low-lying coastal areas, it can be also carried out in inland areas such as lakes and rivers. It is commonly carried out in countries like the Netherlands, where much of the country is below sea level and subject to flooding. About one-fifth of the land in the Netherlands has been reclaimed from the sea. Their largest and most successful project is the Zuider Zee project. Polders have 2 distinct features. Firstly, they are enclosed by dikes to keep the water out. The dikes also serve to protect the polder from erosion. Secondly, polders are continually maintained by systems of drainage canals and pumps which prevent them from becoming waterlogged and hence, suitable for cultivation. Stage 1: Dike constructed around the area to be reclaimed to keep water from coming in. Stage 2: The area is drained using pumps and drainage canals. Stage 3: "Reeds"(a type of salt tolerant plant) are sown by aircraft to help the soil form. Stage 4: After 3 years, reeds are burnt and the ash is used as fertilisers for the soil. Stage 5: After a period of up to 15 years, the polder is ready for growing crops, building houses and constructing roads. This page was last changed on 21 February 2018, at 17:18.